“Did you understand what we were saying?” To this I had to admit that I would only have been able to puzzle out about half of the conversation (not that I’d been listening in). Their colloquy had fallen into the part of my consciousness to which I assign pleasant-sounding auditory static that I can’t figure out, apart from a word here or there. “Well listen, the first thing to learn is to say, ‘Och aye, the noo.’” I know that nobody here says that; plenty of people say “Och, aye,” and occasionally people use “the noo” to refer to the present moment, but somehow “och aye, the noo” has become a stereotyped representation of Glaswegian patter. Rather than quibble with him, I made a few feeble efforts, and when he was satisfied he demanded to know why I was out early on a Sunday morning. I pointed out that I was on my way to church. Apparently Alan is something of a media person. His card shows a picture of him evidently from a production about Greyfriars Bobby (one imagines he played Bobby’s master, not the terrier himself); his IMDB entry indicates that he’s made walk-on appearances in a number of shows, of which I recognized the Glasgow detective program Taggart ; he has made a YouTube video from stills of himself with some of the celebrities he has met (if I’m not mistaken, he’s kissing SuBo toward the middle of the sequence); but most of all, I like the portrait of him from the photographer’s Flickr site. According to the Panopticlick, my browser profile is unique among the quarter million they’ve tested so far — so it would, presumably, be easy to track my browser if someone wanted to spy on my trail of fountain pen sites, Facebook, and Google Reader. If I were worried about this, I’d complicate the enterprise by activating and deactivating various fonts in my system; that seems to be a strong element in the fingerprint process. That way I’d look different every time I browsed. But on the whole, I’m not yet concerned that I might be the target of a browser-based spy ring. I remembered today that my blogiversary comes round this week. Came around, actually, on the 23rd. On 23 January, 2002, I entered a few settings into Blogger.com, pushed the “Post” button, and darned if it didn’t start up a website for me with my daily random thoughts. Eight years of blogging have brought wonderful benefits, but I’m beginning to think I can see the end of it. Not immediately, but eventually I can envision putting more time into focused, larger-scale online writing, and leaving the dailyness to microblog vehicles. I dislike microblogging for a number of reasons, but the community into which I started out blogging has largely faded to inactivity (blogwise — I’m not accusing anyone of laziness). With less tightly-woven sense of writing to people and hearing from them, I feel less sense of obligation to put anything here at all. And I’m certainly busy enough, even busy relaxing, that I can imagine a time when I’m not inclined to bother at all anymore. But that’s not today, and heaven knows I’m wrong often enough, so maybe I’ll just keep chugging away at it. The important thing, though, is that they’ve been eight really good years, with very wonderful friends and readers, and I can’t ever adequately say to the old gang who lured me into this uncanny world how grateful I am for their interest and encouragement. Seeing Euan the other day reminded me what a special experience that initiation was, and how magical the transition from one side of the looking-glass to the other. The neighbours who have moved into Blogaria after it became “normal,” after everyone rolled their eyes at the sound of the word “blog,” missed out on the frontier days — but I will remember them, and cherish them, for they helped keep me sane and showed me some of the cool tricks reality plays when you develop digital extremities. Eight years — and who knows how much longer! Thanks, y’all, a million times. And see you tomorrow. See also Kevin Marks and Michael Pusateri. By the way, Michael, thanks again for that breakfast in California five or so years ago. And now Steven Frank’s. I know Kevin and Michael are certifiably smart, and Steven sounds as though he knows what he’s talking about. I’m beginning to think I was right, and that this iPad really is a big deal in the making, despite the antihype. OK, first make the predictable two or three jokes, some cleverer than others. Get it out of your system, I can wait. Now, what do I think of it? Well, I doubt I can afford one, and I’m not uneasy about that; by the time our finances stabilize, a great many other things will have settled down, too, including prices and apps and specs. If someone wants to donate one, I’ll gladly accept it and put it to work, but I’m not making puppy-dog faces at Margaret over iChat. That being said, I can envision immediately what an iPad would mean for my daily routine. I look at the iPad and I see the main reason I haven’t been drawn into the Kindle world. An iPad will do more, better, in color — and it will do a very fine job of presenting books. And that’s the pulsing heart of such desire as I feel for one: as a recent immigrant to this thistl’d isle, I have had to leave a great proportion of my library behind (as I’ve said before). and I see in the iPad the device that could help me make the transition to digital reading. Most of what I read, I read in unattractive formats. Academic and technical books are generally published with minimal effort toward the selection of paper, ink, page design, illustration (if any), and so on. I would ecstatically trade all my bound copies of academic/technical works for digital copies. Please, make me the the offer. Please. That doesn’t make me post-bibliophiliac. It does mean that I would select the bound books that I buy for their specific physical manifestations. I don’t want (only) digital versions of Edward Tufte’s books . I will continue buying various editions of the Greek New Testament, Bibles, and liturgical books (although digital editions of Ritual Notes , Fortescue , and A Priest’s Handbook would come in awfully handy). It does mean that book publishers will have to earn their bound-book sales, though at the same time they will be able to mass-market digital pulps. It means that bound-books will retain their value for the things that tangible books do best (archival copies, a centuries-old open format) and digital books will be able to flourish for the things they do best (convenience, portability, multimedia hybrid formats, perhaps some interactivity, low backlist storage costs, somewhat adjustable formatting (no separate large-type editions necessary, and machine-audio once the publishing industry recuperates from its cranio-rectal displacement disorder). All of this should be a very good thing for authors. Different, but very good. Plus the iPad will do much else beside present books — those other uses for which gadgeteers are slagging the current iteration of the iPad as “not good enough.” Word: if people play games, watch video, read and send email, and browse the web contentedly on smart phones (and they do — have you noticed? ), they will do so all the more happily with an iPad. If the iPad is as blazingly fast as the people who handled it have suggested, all of these functions will work so smoothly that smartphones will again look as awkwardly clunky as did the monochrome dot-matrixed versions of those apps on early “web-ready” mobile phones. And come on, the bezel about which so many are griping serves the essential purpose of giving a margin for holding the unit. These aren’t flaws, they’re features. Apple hasn’t played all its tablet cards yet. There’s an upgrade to the iPhone OS due in a short while that may well introduce limited multitasking. There’s plenty of opportunity for Apple design engineers to figure out what to do with a camera such that it fits functionally with the uses to which one might put a tablet (did people seriously imagine that someone might hold a legal-pad-sized item up in the air to take photos? Or that a webcam-like unit would work well with the positions and circumstances in which users will deploy iPads? There’s progress to be made on this front, but I think Apple is smart to wait and see how cameras fit into the emergent usage patterns for this new device). It’s going to get better. So I’ve almost talked myself into lusting after one — I see a very strong case for the iPad as a note-taking, book-reading, video-watching, web- and mail-browsing mobile computing platform. That sounds like a huge winner to me. So I’m with Dave (except that he’ll own one before I will). The University of Glasgow is undergoing a comprehensive academic reorganization; all the departments will be dissolved, and the various [now-called] Subject Areas will regroup into larger Schools. The ostensible rationale for this process mostly involves economies of scale, although some colleagues intimate that more sinister administrative priorities lurk behind that innocuous corporate façade. I regret the process; a few years ago, my appointment would have resided in a School of Divinity, then a Faculty of Divinity, then the Department of Theology and Religious Studies that I now inhabit. After those more glorious designations, a “Subject Area” sounds pretty shabby. The reorg involved smaller departments such as ours finding larger departments that were willing to take us under their wing. Such negotiations involve politics, finances, personalities, rivalries, and every other sort of complexity, so it was a relief to learn that TRS would end up with the relatively congenial departments of English Literature, English Language and Scottish Literature. Give the strong literary interests of many TRS staff, this seems like a terrific match. That much was decided a month or two ago; since then, though, we’ve been in a smouldering struggle to select an appropriate name for our newly-unified staff. One might think that “Humanities” would make a fitting label, but the History-based cluster grabbed that one first. “Letters” was mooted as one possibility, “Letters, Language, and Religion” as another, but nothing suited a preponderance of the decision-makers. Today, a final decision was announced: we will be a constituent of the School of Critical Studies, which suits me just fine. I was talking to my across-the-hall office neighbour, and we decided the whole ludicrous drama should be written up in a David Lodge novel. That would make it easier to just laugh at the Sturm und Drang, rather than feeling vaguely apprehensive about what it all portends. 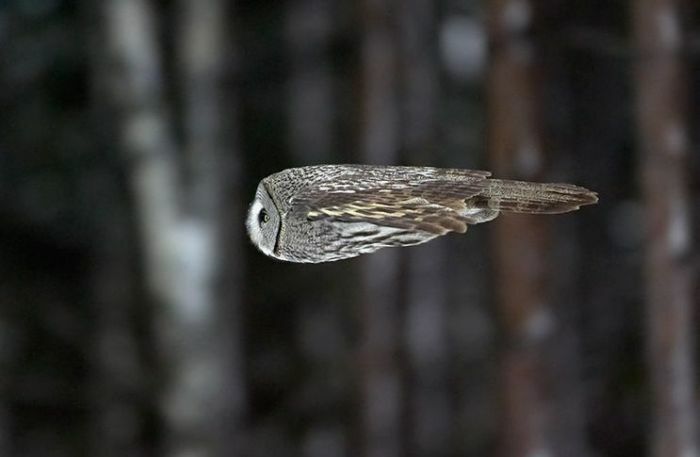 That’s just beautiful, and all the more so when one considers the owl’s stunning adaptation to its hunting life. Owls are a totemic creature for my mother’s side of the family; I wish my Grandfather Emerson had had a chance to see this image. A long time ago, I was a Baltimore Colts fan, and I was deflated by their Super Bowl loss to the New York Jets. All of which means I wouldn’t mind if the astroturf swallowed up both teams in the AFC championship. And I see that Jay Leno put on a great show last night — as reported by an NBC affiliate. Hmmm. 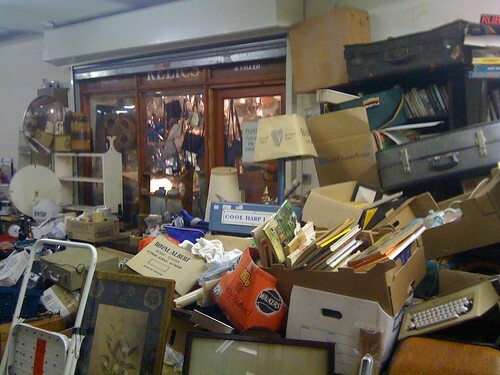 To be fair, they’ve actually cleaned out the interior a lot; I was able to browse much more freely this time than when I had previously stopped in. Still, my point remains. Why keep so much around, when the lower strata remain quite inaccessible to customers? The news outlets are picking up on a report from the International Federation of the Phonographic Industry that bemoans, yet again, the extent to which people use the internet for transmitting data — in particular, for transmitting digital versions of music recordings without the permission of the record companies. We’ve been ’round this bush a million times before, so let’s note by title (as it were) several features of this tendentious reproduction of the industry’s perspective. The article cites industry sources repeatedly and verbatim, and summarizes their perspective, while only alluding vaguely to a contrary outlook. The article reproduces the biased vocabulary of the industry (“piracy”) rather than steering toward more even-handed vocabulary; the only time the article uses “file-sharing,” it quotes the phrase from an industry spokesperson who appends the modifier “illegal” to it. (“Piracy” and “file-sharing” are different phenomena, as the British couple whose lives hang in the balance can testify.) The statistics to which the article refers should be questioned, as in virtually every other case when the recording industry has generated estimates of their losses to file-sharing, the figures have rested on very tenuous assumptions about human behaviour. And the article insulates the industry from the pertinent criticism: that it has repeatedly failed to embrace a changing technological environment for what it makes possible, and adapt their business models to accommodate reality. Instead, they try to institute the legal perpetuation of the ephemeral state of affairs that began about a hundred years ago, and will end pretty much as soon as governing cultures allow it to. I’m in favor of musicians making money, and I’m in favor of the internet doing what it does best (i.e., transmit data). If that means that the specific ways that musicians earn money has to change, that should be a no-brainer — not a basis for legislation that forestalls adaptation to changing circumstances. The other day, my mind flashed the thought “Steve Jobs is John Galt,” and the possibility unnerved me. I see that many others got there way before me, so at least I’m not utterly off my chump. Still, I wish Steve would do something (uncharacteristically) clearly anti-Randian to dispel the connection.